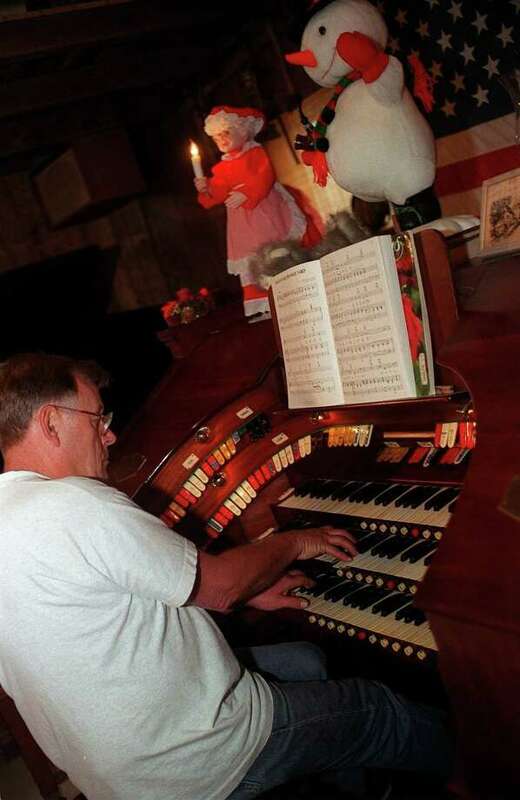 John R. Angevine plays the first sounds of Christmas music in this 1999 photograph. Angevine Farm in Warren is all about family, community and land preservation. The fourth, fifth and sixth generations of the family operate the farm nestled in the Litchfield hills at 40 Angevine Road, following in the footsteps of their ancestors, John H. Angevine and his wife, Mary C. Marsh, who began farming the land in 1868. The original 196 acres of farmland — known as the Marsh Homestead until the couple married — are still farmed. “It’s rewarding to us to be able to go out on the farm and to think about all the generations who’ve come through here,” said Kathy Angevine, who with her husband, John R. Angevine, oversee the farm with their children and families. John R. and Kathy Angevine, and their children, Timothy and Carla Angevine, Scot and Jamie Angevine, and Lisa Angevine Bergs and her husband, Ansie, and the latter couple’s children, Haley and Jordan, all play an active role at the farm. Timothy, who is a member of the Warren Land Trust and Warren Volunteer Fire Co., is manager. The farm will celebrate its 150th anniversary with a music festival, featuring music by Auguste & Alden, Wooden Horse and Atlas Gray, food, a game area, and special guests Sept. 29 from 1 to 6:30 p.m. at the farm. Guests are encouraged to bring chairs and/or blankets. No dogs are permitted. The farm’s history includes dairy farming, tobacco, vegetables, apples, poultry and eggs. In more recent years, pumpkins and Christmas trees have become its main focus. Its picturesque setting also serves as a scenic backdrop for special occasions, such as weddings. In the fall, pumpkins, squash, gourds, maize corn, maple syrup, honey, jellies and goods crafted by local artisans are available in the Harvest Barn, which was originally built to house poultry, but was transformed into a retail space for autumn and a wreath workshop for winter. Visitors can pick a wide variety of pumpkins in the field. After the harvest, visitors can purchase custom-designed wreaths and garland or make their own in the barn. Ornaments and other holiday goods and products by local artisans are available at another site on the farm, in the Christmas Barn, where John R. Angevine can be found playing Christmas carols on the pipe organ. Fraser fir, concolor fir, blue spruce, white pine, Canaan fir and white spruce are among the many trees grown on the farm that can be tagged and cut down in the fields, and purchased precut. Visitors come from near and far to form and build upon their traditions, Lisa Angevine Bergs said. Some families have been coming to the farm for 30 or more years. Customers who once visited the farm as a child now bring their children and, in some cases, their grandchildren. “It’s the location, the people, the warmth and the friendliness,” said Ed Carlson, of Norwalk, about why he returns every year with his wife, Peggy, and a group of about 15 friends to tag and cut a tree, and visit with the Angevines. “We always love to hear John play the organ,” said Carlson, who has been a customer since the 1970s. The farm is also a destination for school groups. Students from Warren School visit the farm throughout the year for farm tours and lessons about the role of agriculture in the community. During winter months, students walk through the fields of trees and “Kathy talks about the animals who live in the trees, and in the fall Tim talks to them about growing pumpkins,” said Warren School teacher Kathy Newton. Many Wamogo Regional High School VoAg students have a connection with the farm, having worked there. Promoting the benefits of nature and preservation are a priority to the Angevines. Tickets to the Sept. 29 celebration are $20 for adults, $5 for children and free for children under 3. Tickets purchased by Sept. 15 will include a $5 voucher for a pumpkin and a $5 food voucher. For tickets, visit angevinefarm.com. For information, call the 40 Angevine Road farm at 860-868-7226.